Professor Chaillet has always been a bit of an enigma to those who have studied his influence on The Shelby Electric Company, his design of the long-lived Shelby lamps and his family. His contributions to the Shelby Electric Company were many, however his knowledge of lamp filaments and construction made it possible for the management team headed by John C. Fish to proceed with the formation of the Shelby Electric Company. His knowledge and capabilities made possible the production of quality lamps in Shelby, Ohio. That knowledge was derived from the time he spent working with his father in Paris where they were manufacturing incandescent lanps. This information was obtained from the June 25, 1897 Shelby News article which in turn was a reprint of "The Shelby Electric Company" article that appeared in the Western Electrician earlier in the year. This article was included in its entirety on the first page of our story and can be reviewed here. The intent of the article, as the title implies, is to describe the talent and experience of those individuals who are critical to the success of this new enterprise. It is assumed that Professor Chaillet provided some or all of the information concerning his previous experience used in this June 25, 1897 article. A bit of light bulb history reveals the incandescent lamp in its most primitive form was invented by Humphrey Davy in 1809. It consisted of a strip of carbon connected to a battery. The carbon glowed and made what was known as an arc lamp. Short lived, but it did produce light. The next step was to place the glowing element inside a glass container and evacuate the air which reduced the rate of oxidation and therefore extended the life of the element. By 1850 several inventors were constructing lamps with charcoal filaments and by 1854 Henricg Globel, a German watchmaker, constructed a lamp with a bamboo strand suspended inside a glass tube and in 1875 Herman Sprengel used a mercury vacuum pump to more completely evacuate the tube to further extend the life of the filament. 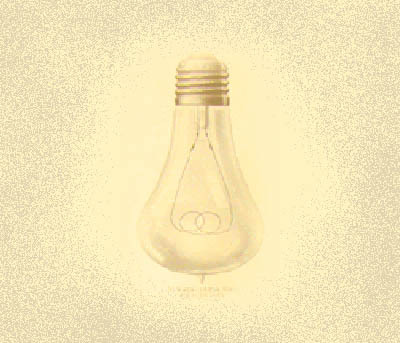 Sir Joseph Wilson's work in 1878 was the beginning of the "long lived" light bulb. Thomas Edison was working on filament designs at this same time. To review some of the opening page of this article, the first documentation known at this time concerning Professor Chaillet is this manifest of the H. M. S Teutonic that sailed from Liverpool and Queenstown to the Port of New York. The Teutonic's master, Peter John Irving signed the manifest on December 10, 1891. The manifest indicates that Adolphe Chaillet, age 24, listed his occupation as "artist" and also indicated that he was French and his last residence was Paris. This voyage was quite significant to Adolphe Chaillet even before his arrival in New York. On board for this voyage was his future father-in-law Ellis W. Bickmore who was part of the Teutonic's crew. Ellis Bickmore, born 1844 in St. George, Maine, a son of Henry Bickmore, a Master Mariner, had become a sailor prior to 1870 and by 1900 was ship's captain. Ellis and Adolphe Chaillet became friends during the crossing and after arrival in New York, Adolphe was invited to visit the Bickmore home in St. George's, Maine. Ellis and wife, Catherine Wall Bickmore, were parents of at least six children, two sons and four daughters, the youngest daughter, Maud L. Bickmore, was 15 years old at this time. During the following year or two, a relationship developed and Adolphe and Maude were married, probably in 1894 or early 1895. They were soon afterward living in Columbus, Franklin County, Ohio. The Shelby News - June 25, 1897 article states that: "Mr. Chaillet came to this country in 1892 to manufacture lamps at Marlboro, Mass. . . . The professor was then engaged in the designing department of the General Electric Company in Lynn, Mass., and has recently completed the design of an electric locomotive for The Jeffreys Manufacturing Company in Columbus, Ohio." The Jeffreys Manufacturing Company designed and manufactured mining equipment, generally coal mining equipment at that time. It was then that Professor Chaillet with all his relevant experience was asked to visit Shelby and soon became what the June 25, 1897 Shelby News article stated was the technical manager of the newly formed Shelby Electric Company. That said, there remains the mystery of his life before and after his six short years of residence in Shelby. It was a very formative time for his family as possibly two and probably all three of their children were born here. 1. Their first child, Alexander Bickmore Chaillet, based on the census information (below) was probably born in Shelby during the exploratory time prior to the official formation and publication of the establishment of the Shelby Electric Company. Alexander's Social Security information however, indicates that he was born in 1893, prior to living in Shelby and maybe during the family's stay in the Columbus, Ohio area. There are two additional pieces of evidence that indicate he was born in 1896 and coupled with the statement on the census that Adolphe and Maud had been married five years would support his birth being in 1896. 2. Arnold, who the census form indicates was born in August 29, 1898, would have been born in Shelby. However, two later pieces of information have him born in 1895 or 1896. These two dates almost have to be incorrect, since Arnold was the second child and assuming Alexander was born in 1896, would require that the correct choice would be 1898. Those same two records (shown later) indicate that Arnold as an adult stated that he was born in Shelby, Ohio. Where the family was living in Shelby at the time of the first two sons' birth is unknown at this time, but their residence must have been rented since there is no record of a home being purchased when Professor and Maud Chaillet first arrived in Shelby. 3. Catherine, their third child and only daughter, was born in 1899 not long after they purchased the home on the Boulevard. Her birth records confirm this date as well. According to the 1900 Federal Census taken in the village of Shelby, Ohio, Adolphe Chaillet and family were living on the Grand Boulevard. Adolphe Chaillet was born Nov., 1867, age 32. married 5 years, born in France, father born in Sweden, mother born in Russia, Adolphe's occupation was listed as manager at an Electric Company and he owns his home with a mortgage. Maude L. Adolphe's wife of 5 years was born April 1877, in Massachusetts (probably actually born in Maine), age 23, her parents were both born in Massachusetts (Maine). She is the mother of 3 children, all of whom are living. Professor Chaillet was born Adolphe Alexandre Chaillet on July 15, 1867 in Paris, France (see below). and godmother is Helene WanKowicz. Translation courtesy of Dan Sponseller of Columbus, Ohio and Marilyn Smith of Cleveland - Thank you ! (see below) by saying: "It is not easy to translate exactly. However, roughly it is written: "
who have signed with us after reading." Rémi Panisset's kind contribution may provide the information that will allow further discovery and insight into A. A.
Paris on October 18, 1834. In July 1867, he was 32, the age given to Adolphe's father according to Adolphe's birth certificate. to pursue investigations. Without it, it is like finding a needle in a haystack." Thanks to Rémi Panisset's interest and kindness, we are finding more about Professor Chaillet one needle at a time! Now that we know a bit more about his early life and parentage and something of his five or so years in Shelby, what happened when the family moved from here? A study of Buffalo, New York city directories is not conclusive concerning a residence there. There appears to be only a 1901 and 1904 Buffalo city directory available for study at this time and names of the the Chaillet family are not listed in either of those Buffalo directories. However, a 1902 Buffalo, New York directory would very likely contain the A. A. Chaillet name. Of course the name is not entirely correct, but the balance of the information is true. Now look at page five of the manifest (directly below page four). Note line 13. Adolph Alexander C., 35, married, electric engineer, nationality - France, race - French, last residence - Mexico, destination - New York City, (comment: not on board). Well, this is also Professor Chaillet and on line 29 is Maud Luis (Louise) Chaillet 25, married, natioality - U S, race - American. The most likely reason for saying that Professor Chaillet was not on board was because he was already included (Anton A. Chaillet) on the previous page of the manifest. There is no eveidence of their children anywhere on the ship's manifest. The manifest from the S.S. Monterey sailing from Veracruz, Mexico on July 7, 1904 and arriving in New York July 16, 1904 includes Maud Chaillet, 26, married, U. S. citizen and daughter, Catherine, 3, U. S. citizen. It seems that the Chaillet family has at the very least, spent time in Mexico. There has been no more information discovered until the 1910 Federal Census. There seems to have been a disruption in the Chaillet family. There are three Chaillet children living with their widowed grandmother, Catherine Bickmore. 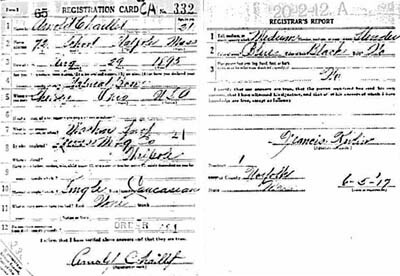 Alexander B. Chaillet is listed as: grandson, age 13 (born c. 1897) in Ohio; Arnold Chaillet, grandson, age 10 (born c. 1900) in Ohio; and Henry M. Chaillet, grandson, age 3 (born c. 1907) in Mexico. Catherine Bickmore indicates that she has had eight children and five are now living. If one checks the 1900 census for this area of Maine, it is found that Catherine "Kate" Bickmore lists her children as eight born and six living. Obviously she has lost a child in the last ten years and that child is the three boys' mother, Maud Chaillet. Notice that in 1907 Henry M. Chaillet was born in Mexico. Perhaps Maud died as the result of Henry's birth and the children have been dispersed to their mother's family. The three Chaillet boys are with their Grandmother Bickmore, but where is Professor Chaillet and daughter, Catherine, who should be about 10 years old by this time. Note: There has been no further information found in any census records about Adolphe and Maud's fourth child Henry M. Chaillet. The 1910 Census indicates he was born in Mexico c. 1907 and was then living with his Grandmother Bickmore along with his other two brothers. Any informtion concerning Henry M. Chaillet would be appreciated. The 1910 Census finds Catherine Chaillet, age 9, in Chicago, Ward 5, Cook County, Illinois living in the John S. Fields household. John and his wife, Emma M., have been married approximately twelve years. John is a commercial traveler and there are also two boarders living in the residence. Emma is Emma M. Bickmore Fields and Catherine's Aunt. There were four Bickmore sisters that survived to adulthood and Emma was born third while Maud had been the youngest Bickmore daughter. So Catherine had gone to stay in Chicage with her Aunt Emma while the boys were staying with Grandma Bickmore in Maine. The highest probability would be that he is in Mexico City. It can be speculated that he is manufacturing lamps in Mexico outside the realm of NELA and GE. 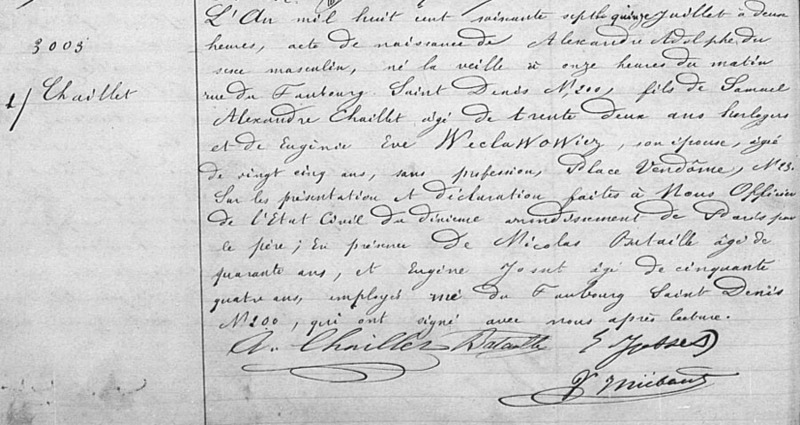 Because of the difficulty in obtaining Mexican birth and death records, verification of Adolphe and Maud's third son, Henry M. Chaillet's birth date and the date that Maud passed away has not been confirmed. Where do we find the next bit of evidence of Professor Chaillet and the four children? Again we find him on two ship's manifests. One in 1914 and the other in 1916. See line 7: Adolphe A. Chaillet, age 48, widowed, Have you been to Canada before - Yes, When - 1890, How long - 2 mo., Country of birth - France, Race - French, Destination - New York, New York, Tourist, Protestant. Professor Chaillet is returning from Yokohama, Japan. Perhaps on a business trip. Arnold Chaillet, age 21, Address - 72 School St., Walpole, Mass., Date of birth - August 29, 1895, Natural born citizen , Where born - Shelby, Ohio USA, Occupation - Machine _?? ?___ , By whom employed - __?? ?__ Mfg. Co., Where employed - Walpole, Single, Caucasian, Medium height, Slender, Blue eyes, Black hair. Arnold Chaillet later indicates that he did serve in the military service during WWI. Alexander Chaillet, age 22, single, Occupation - Mechanics Helper, Nationality - Canada, Race - French, Last permanent address - Kentville, Nova Scotia, Address or name of nearest relative or friend - none, Final Destination - Millis, Mass. Alex Chaillet, age 23, single, Occupation - mechanic, nationality - Canada, Race- French, Last permanent address - Kentsville, Nova Scotia, Address or name of nearest relative or friend - none, Final Destination - Lynn, Mass. Where has the family gone by 1920? There has been no evidence found for any of the immediate Chaillet family appearing in the 1920 census. A check of the Bickmore home reveals that Grandma Bickmore, now 74, is living in Lynn, Massachusetts with her youngest son, Frank, who is now also widowed and the father of two children. No evidence here of any Chaillet children. Alexander is probably still in Nova Scotia, Canada; Arnold could be in Walpole, Mass. ; Catherine may be in Paris (see below); Henry, who would be 13 years old, is not with his Grandmother Bickmore and there has been no record of Professor Chaillet since July, 1916 when he was traveling from Yokohama, Japan. (Line 11) Catherine Chaillet, age 19, single, housewife, Reads what language - French, Nationality - France, Race - French, Last permanent residence - 48 Bld. Jourdan, Paris, France, Final destination - Millis, Mass. Millis, Massachusetts is approximately eight miles from Walpole, Massachusetts where Catherine's brother, Arnold, was living in June, 1917. Maybe she is coming to visit him??? The Boston Directories provide much information on Arnold Chaillet. He first appears in the 1922 directory living at 491 Quincy Street in Dorchester, Mass. (There are no other Chaillet entries in the Boston Directory.) In 1925 through 1928, Arnold is employed as an elevator operator and living at 17 Ramsey, Dorchester, Mass. In 1929 he is employed as a janitor and still living at 17 Ramsey in Dorchester, Mass. The 1930 Census indicates that Arnold is now living at 85 Clifton Street, Ward 8, Boston, Suffolk County, Mass. and he is employed as a janitor in an office building. He records that he is 34 years old (born 1896) and his wife, Josephine, is 37 years of age and they say that they were 23 and 26 years of age when they were married. If Arnold was born in 1898 and was 23 years old when married it would be 1921, however, if he thinks he was born in 1896, he would have been married in 1919. He stated that he was a WWI veteran. Josephine was born in Massachusetts. The 1933 Boston Directory finds them living at 74 Blue Hill Ave. in Roxbury Mass. Arnold is now the Building Superintendent of the Textile Building located at 99 Chauncey Street in Boston. It is a twelve story structure that houses merchants, offices, and some apartments and suites. It is currently the home of the Freedom Trail Foundation in Boston. 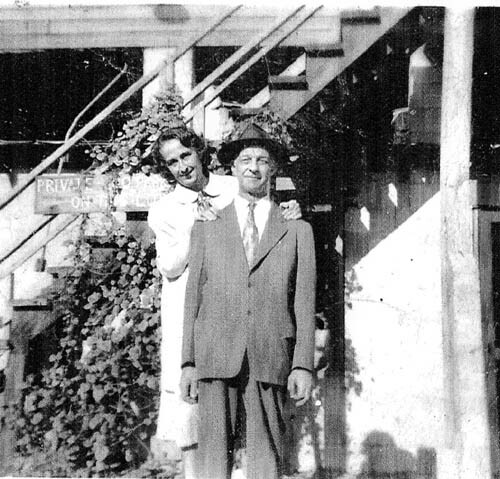 In 1935 Arnold and Josephine had moved to 32 Alexander Drive in Dorchester. They continued to live there until 1942 when they were living at 3 Folsom Ave., Roxbury, Mass. The 1944 Directory still shows Arnold and Josephine living at Roxbury but for the first time, there is another Chaillet entry. It is Josephine M. Chaillet living at 22 Roach Ave., in Dorchester, Mass. Is this Arnold's wife? The 1947 directory shows that Arnold and Josephine have moved to Watertown, Mass,, about eight miles west of downtown Boston. Arnold is still the Building Superintendent of the Textile Building and Josephine M. Chaillet is still living at 22 Roach St., Dorchester, Mass. This continues until 1961, when there is an entry that states: Josephine M. Chaillet (widow of John) 22 Roach St., Dorchester, Mass. Arnold Chaillet is still listed at Watertown, Mass. The 1930 Federal Census in Dallas County, Texas reveals the fact that Alexander Chaillet has returned to the States from Nova Scotia, Canada and he is now living in Dallas. He is living as a guest in a hotel on Live Oak Street and he is employed as a cook or chef for the hotel. Under personal description he has indicated that he is 36 years old, it was first written "single" then "married" and then 29 for the age when first married. Alexander Bickmore Chaillet married Lou Etta George (c. 1923) who was from Blue Mountain, Miss. They were the parents of Alexander B. Chaillet II and Maude June Chaillet. The family lived in Mexico and my grand father had the lamp plant there before the revolution of Pancho Via. My dad said his father was very stern with him, and when the house servants would steal things and blame him for it and he would hide in the attic. His mother sent him to live with an aunt in Maine. He was about ten or twelve years old at the time. He worked as a cabin boy on one of the ships for his uncle. He said his mother died in Mexico and was buried there near the Chapultepec Castle. I can't find any record of it. and I don't know when or where my grandfather died. My dad said the last time he saw him was in New York and he was taking some electric equipment to Russia. My father moved around a lot during his life before settling down. He left home at an early age. He had a previous marriage before he married my mom. They had no children together although she had a son. I don't know their names. My father worked at the Adolphus Hotel in Dallas, several country clubs and a synagogue. Back then, I guess they would call him a cook but today he would be considered a chef. My mother's name is Lou Etta ( maiden name George) from Blue Mountain, Miss.. My father's name is Alexander Bickmore Chaillet, Sr. 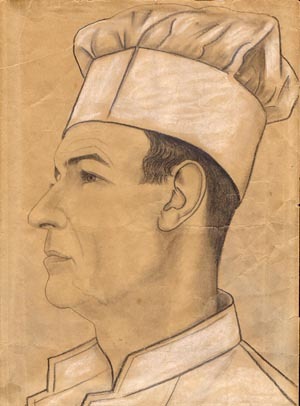 He was a chef most of his life and he served in the Canadian Army during WW1. He was injured and walked with a limp. Alexander II also sent this artist rendering of his father Chef Alexander Bickmore Chaillet. both were living in Memphis, Tennessee at the time of their passing. and his wife live in Pocahontas, Arkansas. Maude June Chaillet (Alexander Bickmore Chaillet's daughter) married Donald Van Dunn. Many thanks to you Alexander for sharing your family story, pictures and memorabilia with us. For the conclusion of the Chaillet Family story, see page 6 below. If there is anyone who would like to share further information about Adolphe Chailllet's family, please contact us at the Shelby Museum. Copyright &COPY; 2011 - 2017 - The Shelby Museum Of History, Inc.